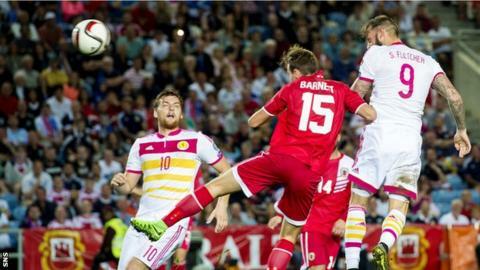 Scotland ended their failed Euro 2016 qualifying campaign with a comfortable win over the part-timers of Gibraltar. Gordon Strachan's side were utterly dominant and rewarded the loyalty of a large travelling support with an emphatic if meaningless win. A Chris Martin header and Shaun Maloney's curling shot had Scotland two up at half-time. Steven Fletcher's second-half hat-trick and Steven Naismith's late finish gave the Tartan Army more to cheer. The resounding nature of the victory does little to assuage the disappointment at failing to qualify for next year's tournament in France. The fourth-place finish has already resulted in much soul-searching, not least by the manager who has yet to indicate whether he will still be in charge when qualifying for the 2018 World Cup commences in Malta next September. The travelling supporters made their thoughts on the matter clear, with renditions of 'Only one Gordon Strachan'. Whether the manager is minded to give them the answer they desire should become clearer in the coming days. Whether Strachan learned anything over the course of these 90 minutes that would help him in future preparations - should he stay - is arguable. The match resembled a training exercise, often a shooting practice, against a team that, for all their endeavour, still looks out of place on the international stage. That said, Scotland played some nice football and, with a bit of fortune and care, might even have scored double their final tally. Maloney went close on three occasions before his goal, Fletcher hit a post, Matt Ritchie had a header cleared off the line and Johnny Russell was denied by Jamie Robba from close range. An assured performance by Andy Robertson - surely the first-choice left back for the next campaign - was another positive element, as was a marauding display on the right by Alan Hutton, free of defensive concerns. So too the endless willingness and quick-thinking of Maloney, though for him and one or two others in the team another attritional campaign may have limited appeal. Fletcher made a strong case for his continuing inclusion up front with his second hat-trick of the campaign against Gibraltar. Buoyed by his stunning strike against Poland, the striker looked lively throughout and, though frustrated in front of goal in the first period, he headed in Hutton's cross early in the second half. That was quickly followed by his second - a clever slotted effort in off a post. But he saved the best till last - a curling shot reminiscent of Thursday's goal, which came off the underside of the bar before nestling in the net. Match ends, Gibraltar 0, Scotland 6. Second Half ends, Gibraltar 0, Scotland 6. Goal! Gibraltar 0, Scotland 6. Steven Naismith (Scotland) left footed shot from the right side of the box to the bottom left corner. Assisted by Steven Fletcher. Substitution, Gibraltar. Mikey Yome replaces Kyle Casciaro. Offside, Scotland. Darren Fletcher tries a through ball, but Steven Fletcher is caught offside. Attempt saved. Johnny Russell (Scotland) left footed shot from the centre of the box is saved in the centre of the goal. Assisted by Steven Naismith. Hand ball by Shaun Maloney (Scotland). Goal! Gibraltar 0, Scotland 5. Steven Fletcher (Scotland) left footed shot from outside the box to the top left corner. Assisted by Steven Naismith. Attempt saved. Johnny Russell (Scotland) left footed shot from outside the box is saved in the top left corner. Assisted by Shaun Maloney. Alan Hutton (Scotland) wins a free kick in the defensive half. Substitution, Gibraltar. John Paul Duarte replaces Lee Casciaro. Attempt missed. Steven Naismith (Scotland) right footed shot from the centre of the box is too high. Assisted by Shaun Maloney. Attempt missed. Steven Fletcher (Scotland) left footed shot from the centre of the box is too high. Assisted by Andrew Robertson. Substitution, Scotland. Steven Naismith replaces Chris Martin. Attempt missed. Liam Walker (Gibraltar) left footed shot from outside the box is close, but misses the top left corner. Assisted by Lee Casciaro. Christophe Berra (Scotland) wins a free kick in the defensive half. Foul by Christophe Berra (Scotland). Roy Chipolina (Gibraltar) wins a free kick in the defensive half. Corner, Scotland. Conceded by Jean Carlos Garcia. Attempt missed. Chris Martin (Scotland) right footed shot from the centre of the box is high and wide to the right. Assisted by Alan Hutton. Attempt missed. Johnny Russell (Scotland) left footed shot from a difficult angle on the right is too high. Assisted by Chris Martin. Attempt missed. Kyle Casciaro (Gibraltar) left footed shot from outside the box misses to the left. Attempt missed. Joseph Chipolina (Gibraltar) left footed shot from the left side of the box is high and wide to the left. Assisted by Liam Walker. Substitution, Scotland. Johnny Russell replaces Matt Ritchie. Substitution, Scotland. Darren Fletcher replaces Scott Brown. Kyle Casciaro (Gibraltar) wins a free kick in the attacking half. Attempt missed. Chris Martin (Scotland) left footed shot from very close range misses to the right. Assisted by Andrew Robertson with a cross. Substitution, Gibraltar. Brian Perez replaces Daniel Duarte. Goal! Gibraltar 0, Scotland 4. Steven Fletcher (Scotland) left footed shot from the right side of the box to the bottom left corner. Assisted by Chris Martin. Attempt saved. Chris Martin (Scotland) right footed shot from outside the box is saved in the bottom left corner. Assisted by Shaun Maloney. Attempt blocked. Steven Fletcher (Scotland) right footed shot from very close range is blocked. Assisted by Andrew Robertson. Scott Brown (Scotland) wins a free kick in the attacking half. Goal! Gibraltar 0, Scotland 3. Steven Fletcher (Scotland) header from the centre of the box to the top right corner. Assisted by Alan Hutton with a cross.